Located one block off Main Street, the 100 year old Victorian mansion graces Jamestown with its rare arched windows and tower. Eight unique rooms, all with private baths. The inn was refurbished to modern standards in 1985. The Victoria Suite offers a double Dormer vaulted ceiling, a sunny sitting area and a view of the garden. The Grand Suite offers a king-sized bed, 3' x 5' marble shower, vaulted ceilings and a private balcony. Any of our rooms offer a perfect hideaway that makes your occasion special. Small intimate weddings and vow renewal ceremonies, retreats, reunions and romantic getaways is our specialty. More home than a hotel.... We spoil you for anything else. Amenities include a full homemade breakfast served daily from the marble soda fountain bar. Air-Conditioned, TV, Non-smoking for your comfort, wheelchair access, and private parking. Rates: Double occupancy prices range from $95 through $155. Additional person $15 extra. Credit card guarantees room, 5-day cancellation for full refund. VISA, Mastercard or AMEX accepted. 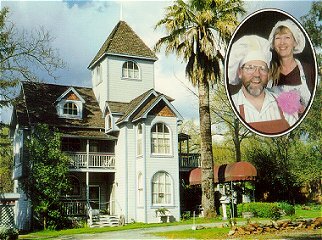 This and other Gold Country Bed and Breakfast Inns can be found here in The Register. 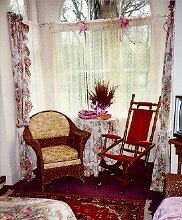 Romantic Country Inns, Getaways and B&Bs offer a great California lodging alternative to big hotels.